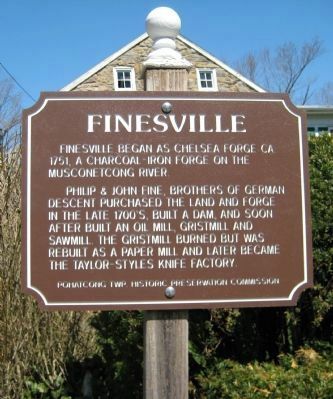 Finesville began as Chelsea Forge, ca 1751, a charcoal - iron forge on the Musconetcong River. 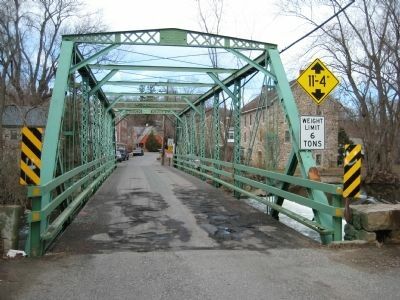 Philip and John Fine, brothers of German descent purchased the forge in the late 1700's, built a dam, and soon after built an oil mill, gristmill and sawmill. The gristmill burned but was rebuilt as a paper mill and later became the Tayloe-Styles knife factory. Location. 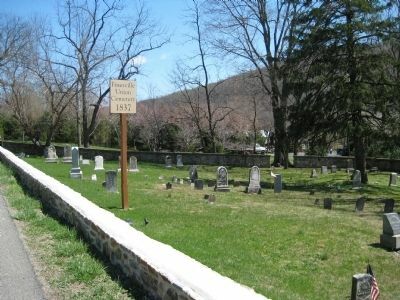 40° 36.397′ N, 75° 10.241′ W. Marker is in Finesville, New Jersey, in Warren County. Marker is at the intersection of Mt. 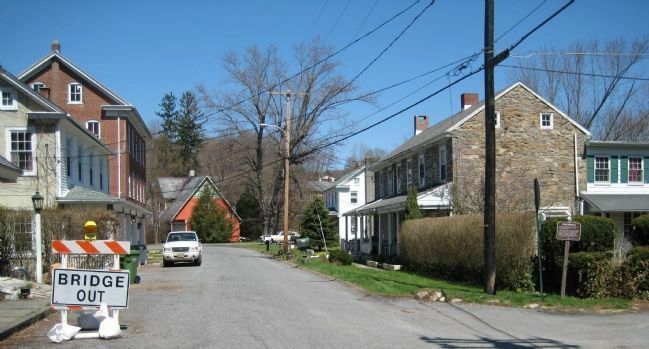 Joy Road and Musconetcong Street, on the right when traveling north on Mt. Joy Road. Touch for map. Marker is in this post office area: Phillipsburg NJ 08865, United States of America. Touch for directions. (approx. 1.2 miles away); Hughesville (approx. 1.3 miles away); Riegelsville Roebling Bridge (approx. 1.4 miles away in Pennsylvania); Mid-Atlantic Highlands (approx. 1.4 miles away in Pennsylvania). Touch for a list and map of all markers in Finesville. More. Search the internet for Finesville. Credits. This page was last revised on June 16, 2016. This page originally submitted on April 12, 2009, by Alan Edelson of Union Twsp., New Jersey. This page has been viewed 1,672 times since then and 19 times this year. Photos: 1, 2, 3, 4. submitted on April 12, 2009, by Alan Edelson of Union Twsp., New Jersey. • Kevin W. was the editor who published this page.